Leaf: The 1–6 cm leaf has a short tapered sharp to blunt tip, is thick and juicy (succulent) and without hairs. 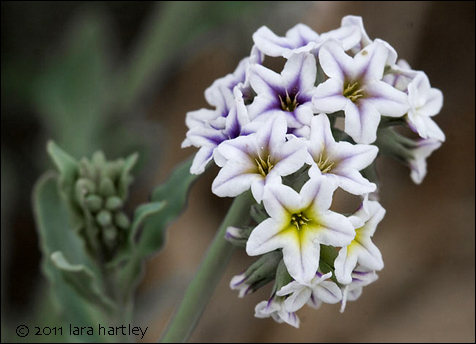 Notes: Heliotropium curassavicum, a dicot, is a perennial herb that is native to California and is also found outside of California, but is confined to western North America. This photo was taken in the salt flats near Newberry Springs, San Bernardino County, on California April 6, 2007.